The photo is of my great aunt in her roaring twenties days. What a kick! I love using old family photos in projects. I used several different household items to create this canvas. I used a big piece of lace as a stencil to create the pattern at the top. I just laid it down on the canvas and spritzed the mist through it (and now I have a pink piece of lace for another project). I also used strips of masking tape to add texture under the misting and a piece of feather from my feather duster. On the cardstock for the diecut flowers I first spread on a thin layer of heavy gesso and then squished plastic netting from a mesh fruit bag into it to dry. Then I diecut and misted the flowers. I think the netting gives them a great texture. Finally, I used a lid from a bottle of Tropicana orange juice. How you may ask? 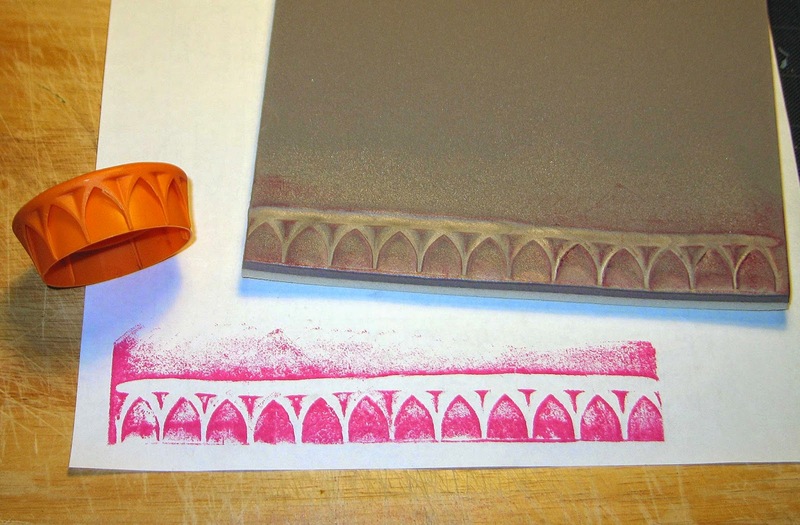 Ranger Cut 'n Dry foam has a firm side to it that you can heat with a heat gun and press objects into it to make your own custom stamps. I rolled the lid across the warm foam to make a cool stamp! Most of the supplies I used for this canvas can be found at Inspiration Emporium. Follow the links below and use my code JUICE to save 10% if you go shopping. I will also point out that US shipping is always $5 and international shipping is just $10! Great use of items from around the house for your mixed media project! The photo is priceless!! 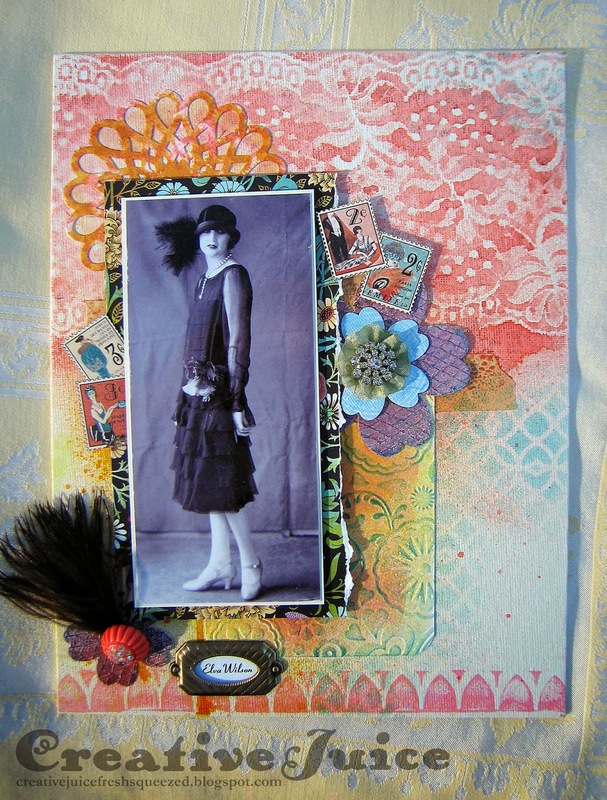 Thanks for playing along with our Mixed Media Monthly Challenge! Beautiful canvas! I love that you used a family photo and your use of household items was so creative! Thanks for joining us at The Mixed Media Monthly Challenge. What a beautiful project. So elegant. Thank you for joining with the Mixed Media Monthly Challenge! how beautiful! i love that photo of your aunt, what a thing to treasure! Thank you so much for playing Around the House with the Mixed Media Monthly Challenge! Super! Love the personal photo and stamp bellies. Compendium of Curiosities 3, Challenge #6!